When planning a PBL unit, use GBL elements to teach 21st-century skills, as a modality for lesson content, to differentiate instruction, or with games as products. Project-based learning has essential components that make it unique to other models of instruction, such as public audience, voice and choice, driving questions, and teaching and assessing 21st-century skills. PBL requires that all of these components be present in a truly great "main-course project." Similarly, game-based learning has elements that make it unique, even in its many implementation methods. GBL can look like gamification, where game elements such as quests and incentives are used to make the unit of instruction into a game of sorts. GBL can also look like using games for instructional purposes, such as the popular Minecraft or even Angry Birds, to support student learning. Many educators may wonder how they can leverage GBL practices within a PBL project and combine them to form a powerful learning experience. It is possible, but only with careful combination and intentional implementation. An important component of a PBL project is teaching and assessing a 21st-century skill (or skills) within the project. This is frequently an area of growth for new PBL teachers, because it's not often that we're asked to do this in the classroom. GBL leverages using games in the classroom, and these games can be targeted to help scaffold collaboration, critical thinking, communication, and creativity. We all want our students to be risk takers, so introducing games that create a safe space to take those risks can support student learning a PBL project. While many games are individual in nature, many are also collaborative. Some games like Pandemic even require collaboration to solve problems together, rather than being competitive. Educators can select games aligned to one of the 4Cs to create low-stakes, fun opportunities to practice working together, communicating effectively, solving problems, and being innovative. You might use a game to teach students content, or have them practice with the content. Perhaps students are making recommendations to a senator about policies surrounding a local or national issue. In order to do that, they might play a specific iCivics game to support them in learning that content. There are already great games out there that can help students practice with the content or learn to apply it in a new situation. As educators plan a project and backwards-design the content and skills they want to teach, they can identify appropriate games that will scaffold the content. Remember, these games can be digital, board, or card games. If you, as an educator, want to make sure that the game will support learning, the best way to see for yourself is by playing it. Many educators are leveraging games as products of student learning, whether as the content itself or as a demonstration of coding and programming skills. A game product can be a great choice as a demonstration of student knowledge. It's important, though, that this choice fits the purpose of the project. Voice and choice aren't arbitrary elements of a project -- they align to the "why" captured in the project's driving question. If making a game that wrestles with the content aligns to the purpose of the project, then it can be a great choice! In addition, a game could be a collaborative, team product, or an individual product. Paired with an excellent rubric, a game can align content and skills to learning outcomes and standards. Often in a gamified unit, students are given quests to accomplish that will help them learn content and skills. A PBL project might have some similar quests or mini games, and students may even have voice and choice regarding which ones they can or need to do. Through effective formative assessment practices, educators can help students select the most effective quests and games within a PBL project. Not every child may need to do the quest or game that you think he or she needs. Differentiation through quests and games is hinged on effective formative assessment. Badges alone will not create sustained engagement. However, there are some students who love to "collect," and many of our students play games that support the gamer mindset. I know students who love to get the best armor on World of Warcraft or collect every single Pokémon possible. Badges can support this engagement. We also need to remember that not all of our students are collector types, so badges may not be the best tools for them. If you do intend to use badges and incentives, ensure that the badges align to meaningful rewards, not just completion. Have badges that specifically address a 21st-century skill, giving or receiving feedback, or presenting to a public audience. These are all important aspects of project-based learning. Create badges that align to PBL best practices so that they support a better PBL culture and aren't simply a way of saying, "Good job!" Remember, there may be some elements of GBL that might take away from a PBL project. For instance, completely gamifying a unit could make it just a gamified unit and not PBL. Educators should use their professional judgment about when and where to leverage GBL elements in a PBL project, and they should be perfectly fine saying, "No, it doesn't fit right now," or "Yes, this can work!" Instead of trying to squeeze all aspects of GBL into PBL, find the right fit that will make your PBL project more engaging. 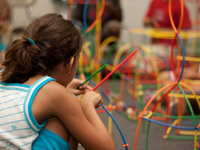 Have you blended game-based learning with project-based learning? What was your experience?